While Hannibal Lecter's suits are undoubtedly the most eyecatching costumes on the show, I found myself really warming to Abigail's costuming when rewatching season 1. Her clothes in "Potage" are particularly interesting, because they were bought for her by Alana Bloom. This means that rather than wearing her own clothes, she's actually dressed in Alana's interpretation of Abigail-clothes. 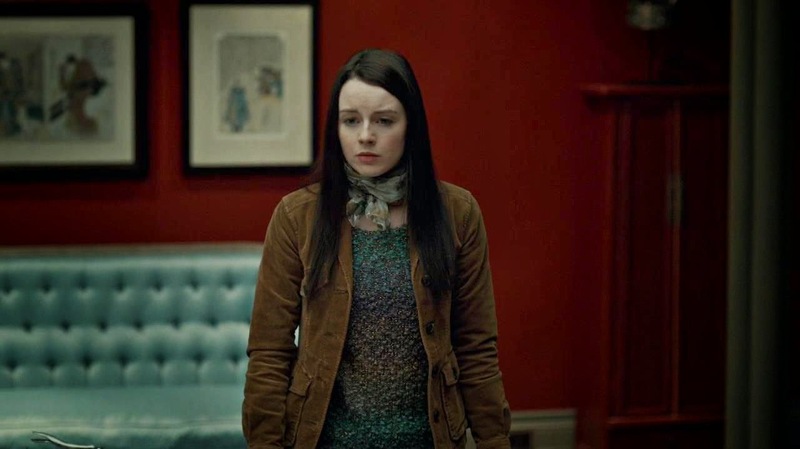 Abigail may be an emotionally fragile 17/18-year-old girl, but I'm glad to say that she's neither dressed up like a TV teen (which wouldn't remotely fit in with the overall tone of Hannibal), or styled to look more childlike and therefore ~vulnerable. Like the adult characters, she has a very specific dress sense and colour palette, which in her case is very "outdoorsy". Either she's wearing sensible hunting clothes to spend time in the forest with her father, or she's dressed in green and brown, often surrounded by natural imagery of plants and flowers. While Hannibal is a Francis Bacon painting and Will is an Edward Hopper, I think Abigail is a botanical illustration. 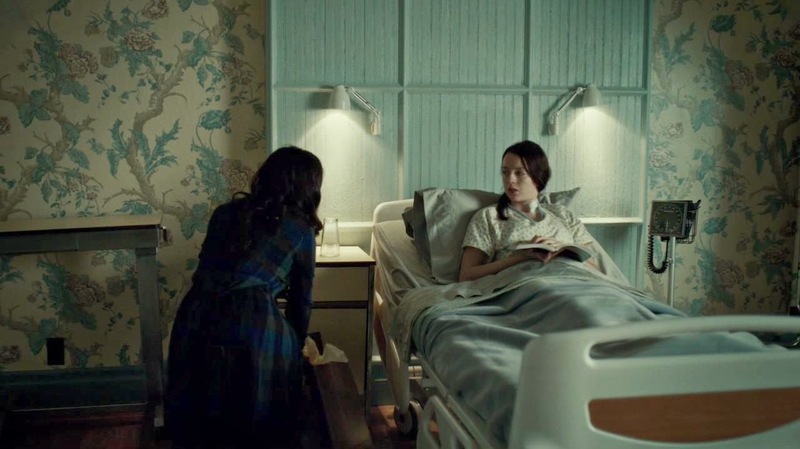 Abigail's hospital room is very serene, with her butterfly-patterned nightdress matching the pale blue-green bed linen, furniture and patterned wallpaper. This delicate floral motif is directly at odds with Freddie Lounds, who shows up wearing a leopard print dress, a red-lined cape and gloves. Freddie looks practically Disney villainesque in her predatory role as Abigail's unwelcome visitor, and is the one central character in the episode who isn't wearing an outfit that fits in with Abigail's colour palette. Compared to indoor characters like Bella and Bedelia, Abigail's scenes often take place outdoors and surrounded by plants. 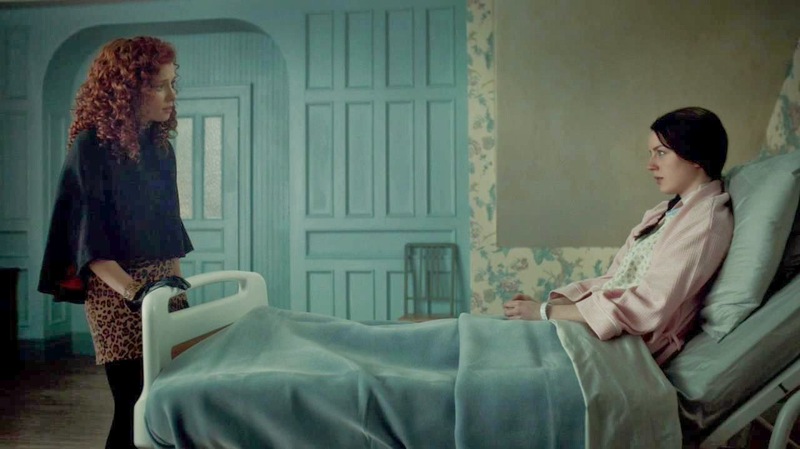 Her outfit for her first trip outside her hospital room is a floral scarf (matching her hospital room wallpaper) and a teal coat that complements the blue/teal outfits worn by Hannibal and Alana when they visit Abigail's family home later in the episode. As ever, Hannibal's costume is significant. 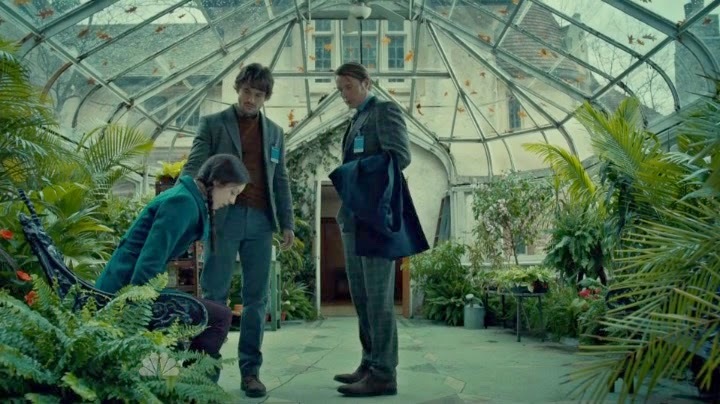 Taken on its own, Hannibal's sweater/jacket combination is already relatively unusual for him because it isn't a true three-piece suit. Along with its complementary colour scheme to Abigail's outfit, it has a couple of other possible meanings. First, the high-collared look is somewhat reminiscent of the kind of vampiric 18th/19th-century European aristocrat that Hannibal is partly modelled upon as a character. Secondly, the sweater/plaid jacket combination is basically a hunting outfit, which fits perfectly with his current role of stalking Abigail as potential prey. 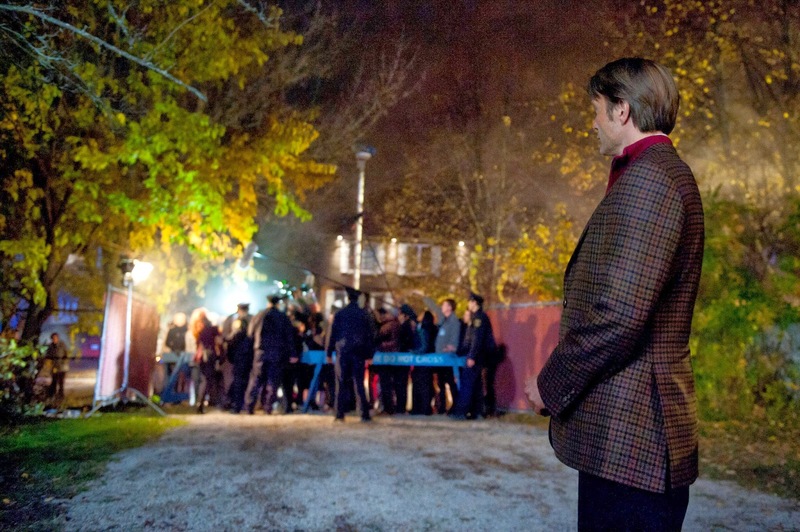 When they revisit the Hobbs house later in the episode, Hannibal has changed into a brown/red version of his earlier outfit, which immediately gives him that demonic undertone we know and love. After Abigail stabs Nicholas Boyle, we get this brilliant shot of Hannibal's blood-coloured sweater and brown hunting jacket perfectly complementing the brown interior of the Hobbs house -- and the drying blood on Abigail's hands. Meanwhile Abigail and her blue-green outfit stand out from the background for the first time in the episode. One thing I found interesting when rewatching these early episodes is that while the show makes an effort to characterise Abigail as Will and Hannibal's "daughter," she actually looks way more like Will and Alana's child, both physically and in terms of costuming. With her fair skin, dark hair and scarf/coat outfits, Abigail looks a lot like Alana, while her more outdoorsy outfits firmly put her in Will's camp. Will (an angler) and Garrett Jacob Hobbs (a hunter) both dress pretty similarly when they're not at work, with both wearing warm sweaters and pocketed gilets -- a look we see on Abigail herself during flashback scenes, and in her brief appearance in Will's fishing dream in season 2. 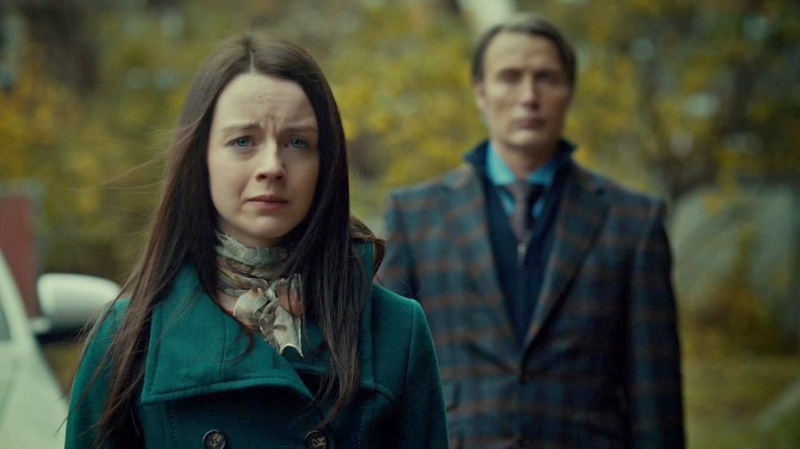 "Potage" is really the only episode where Hannibal and Abigail look remotely similar, although Hannibal is approaching the hunter aesthetic from the English country gentleman end of the scale, while Abigail is the daughter of a typical American working-class hunting enthusiast. Still, it means that Hannibal actually changes his own style in a way that fits in with Will and Abigail's more casual dress sense, which we never really see again for the rest of the series. H.L. would wear something like the Vacheron Constantine Patrimony; elegant and refined, yet simple and classic at a much more reasonable level of luxury. Not that it's particularly important, but Beverly wears jeans, doesn't she? Still a feat. This continues to be generally great. Hi, found this site after watching the first episode of season 2 and I am fascinated! I had already thought there must be more to the clothes than first appears as they seemed to be chosen with such care and attention to detail but hadn't realised just how deep it goes. I have sometimes found myself so lost in admiration for Hannibal's outfits that I have had to rewind, as I have missed some dialogue. Please keep up the good work! The blue-faced Lange you picture has a somewhat modern, sporty look and might not be as readily perceived as a traditional dress watch. Actually, chronographs in general (analogs with stopwatches, which includes both the Patek and the Lange discussed here) are not traditional features on dress watches; this is a feature associated with aviation and "sporty" activities (although the rules are not fixed and seem to have been relaxed in recent years). However, (a) Hannibal's carefully plotted criminal activities (and perhaps his cooking?) might well call for the use of a chronograph; (b) presumably he has more than one watch (and should not have trouble acquiring new ones). What if Hannibal didn't buy the watch, but was given it by Bedilia? Their relationship is long and complex and she projects the same highly cultivated, emotionally reserved and refined image as Hannibal. Given what we now know about their past and how layered with guilt, fear, shame and gratitude it is, I don't think it would be strange if she were to have given him an incredibly expensive gift. Interesting mention of Bedilia in that, in S1E13, her kitchen features similar aspects of Hannibal's dining room, albeit less refined. Specifically, when she is talking with Jack Crawford in her kitchen one immediately notices her wall that features green plants (herbs?) on shelves much like the far grander display found in Hannibal's dining room. Perhaps this is a way of intimating her similarity to Hannibal while at the same time illustrating his penchant for taking things much further. Her display looks utilitarian while Hannibal's becomes an ornament in his visually arresting setting. While both may be herbs, Hannibal's appears to be more garnish. Patek Philippe watches are doubtlessly great. 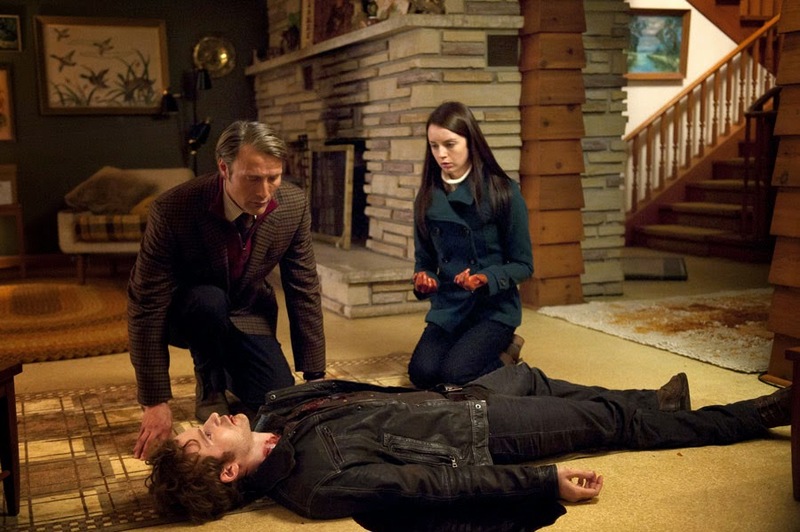 Costumes and design in NBC's Hannibal, Part 2. Costumes and design in NBC's Hannibal, Part 1.